The piece below is courtesy of the National Renewable Energy Lab (NREL). You can view the .pdf here. You can also learn more about the Research Grants we offer that enabled this project, and start dreaming up your own. High up in the alpine, above the tree line where the air is thin and the sun is bright, the seemingly inhospitable alpine ecosystem supports an incredible range of native species including mountain goats, marmots, and pikas. Nestled beneath our climbing boots and the crunch of the fallen alpine snow lives another world of microscopic treasures like arthropods, fungi, bacteria, and algae. To 2017 American Alpine Club (AAC) research grant recipient Rachael Mallon, the fragile yet resilient ecosystems of the alpine environment drive her curiosity and passion for scientific discovery and climbing. While studying biology at the University of Puget Sound, Rachael spent two summers hiking on glaciers throughout the Pacific Northwest, researching the phylogeography and ecology of ice worms. "I love the solitude of the alpine environment and the crazy swings between the seasons," Rachael said. "At the same time, I respect how harsh the environment is and how creatures—great and small—survive and shape the alpine ecosystem." Today, Rachael researches snow algae in the Cascade Mountain Range while pursuing a master's degree in biology at Western Washington University. AAC's research grant helped fund her research on the changes in snow algae communities by geographic location. Dormant in the winter, snow algae are invisible to the naked eye until spring when increased levels of light and water stimulate growth. Algae practice photosynthesis—turning sunlight, carbon dioxide, and water into oxygen and chemical energy in the form of sugar—until they grow into a massive "bloom" of algal biomass. Watermelon-colored pigmentation is a characteristic of the bloom. This results in a wavy sea of pink-colored snow sloping up through the tundra. Like human sunscreen, the pigmentation allows snow algae to withstand the intense ultraviolet rays from the sun at that elevation. 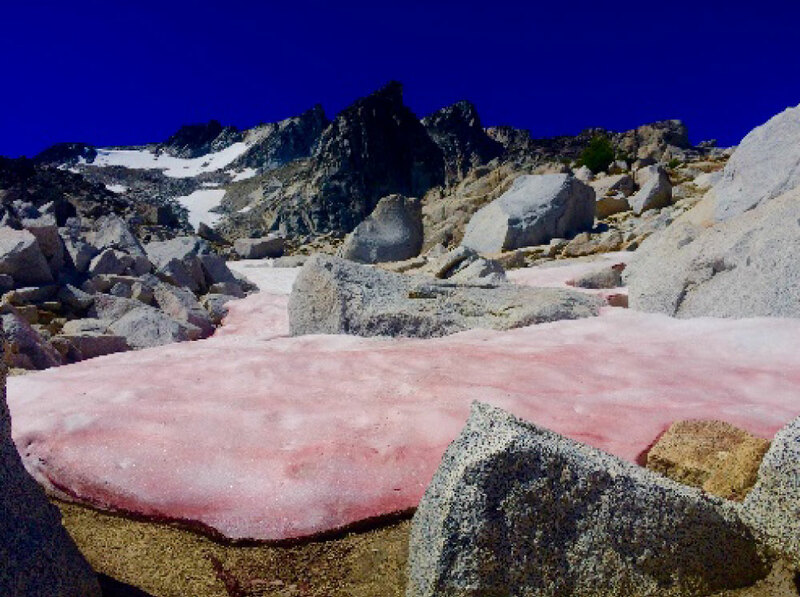 The watermelon pigment serves another purpose, increasing the snow algae's preferred habitat for photosynthesis—water. Like wearing a black t-shirt on a hot sunny day, the darker-colored snow absorbs the sun's rays, increasing the amount of liquid water. "The beauty of the snow algae is its ability to engineer an ecosystem and nourish other tiny alpine creatures," says Rachael. "Through photosynthesis the algae create sugar, which is also a food source for the ice worms, fungi, and bacteria." Previous research of snow algae communities shows that watermelon snow harbors 2–40 species of algae. Although snow algae are found on every continent, research to address changes in these algal communities by geographic location has been limited. Rachael's research tracks snow algae communities in the Cascades to see how they differ based on where they live. "My research will be the first comprehensive snow microbe biodiversity study across the whole Cascade mountain range," said Rachael. On each peak, she would collect two to eight samples from different locations and record information like latitude and longitude, quality of the snow, elevation, and aspect of the slope. Back at the lab, the snow algae samples undergo DNA extraction and then molecular analysis. A component of the snow algae DNA helps determine which species of snow algae it is. After analyzing the field and DNA data, Rachael will be able to describe how snow algae communities vary throughout the Pacific Northwest, including how these communities change with respect to time and altitude. Ironically, the way that snow algae survives intense solar radiation creates a biofeedback loop causing glacial snow to melt even faster. "A recent study on the Harding Icefield in Alaska found that snow algae can increase the amount of melting by four times the amount that white snow would," Rachael said. "Currently, snow algae impact on glacial snow melt within climate change models is not taken into consideration. If we don't consider snow algae in the bigger picture of glacial melting within these models, then we aren't getting the full story how glaciers are impacted over time." With the help of an American Alpine Club Research Grant, Rachael was able to continue her study of these tiny treasures and their influence on the ecosystem. "It's inspiring to me for a community like the AAC to use a portion of their dues to fund alpine research. I’m so grateful that the AAC is supporting scientists who work to understand and preserve the climbing areas that we care about."